LONG ISLAND, NEW YORK ― The Violin Channel recently caught up with Ms Suzanne D’Addario Brouder, Director of the D’Addario Foundation – a unique grant-making organisation providing monetary and product support to high-quality sustainable music instruction programs. 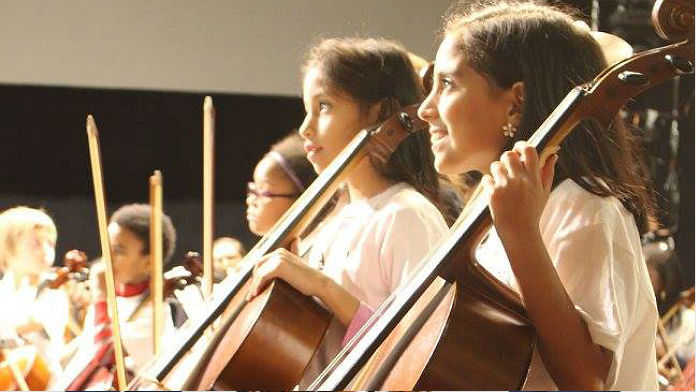 In a VC-exclusive blog, Suzanne talks us through the benefits and necessity of quality music education – and the role the D’Addario Foundation plays in its facilitation. Organizations like the D’Addario Foundation are keenly aware of the power of music, and we’re harnessing it by nurturing the development of private-sector, not-for-profit music-education programs in schools where music barely exists—or does not exist—and where kids cannot afford to take lessons on their own. These humble programs have a much grander vision than simply encouraging children to participate in music, though. These programs are catalysts for positive social change, planting their feet firmly into tough communities and committing completely. In such cases, music education is the vehicle – the draw – that makes the magic happen. But it is the elements beyond plucking a string or singing a note, however, that are extraordinary. And that’s where the true power lies. It’s what happens when you give kids a place to belong every day after school. You give them a snack; you give them help with homework; you give them guidance; you give them the ability to become a mentor; you give them safety. Those programs are proving to have the power to lift human aspirations, to elevate quality of life and to strengthen communities. And it’s all through music. In the New York Times article, “Is Music the Key to Success”, written by Pulitzer Prize-winning journalist Joanne Lipman, she writes, “Look carefully and you’ll find musicians at the top of almost any industry.” Music can help make you a Nobel Prize winner, an Oscar-winning director or a hedge fund billionaire. Leaders from Google Co-Founder Larry Page, Federal Reserve Chairman Alan Greenspan, and Condoleezza Rice to Jack Dorsey, Woody Allen, and Steven Spielberg have all attributed their success to actively studying music in their childhood. Clearly, music education has incredible power, and the proof is there. Ninety-six percent of students in many of these community-based programs supported by the D’Addario Foundation are graduating on time and attending college, despite residing in some of the poorest neighborhoods in our country, where graduation rates hover at or below 50 percent. In fact, many of the students represent the first generation in their family to attend college. Can you imagine the abundance of power you would have if you were able to overcome the challenges you faced early in life? Active participation in music via community-based programs gives kids that power. It’s the ability to defy odds, attend college, and succeed in life. In a complicated world, the children who are given opportunity through compassion, fortitude and dedication are the ones who are empowered to change that world. They are the kids who will become compassionate healers, guides, problem solvers, peacemakers and musicians. There’s nothing more heartwarming than to see children with that power, and there’s nothing more beautiful than using music as a powerful agent for positive change. On September 22, 2016, the D’Addario Foundation hosts the “Music Makes You” Benefit Concert at BRIC in Downtown Brooklyn to raise funds to continue to serve these amazing partner programs. Not only will you see “children with that power” and “music as a powerful agent for positive change,” but you will get to see an array of performers such as Karen O and Nick Zinner of the Yeah Yeah Yeahs, Blake Mills, Lucius, Kaki King, Julian Lage and many more.